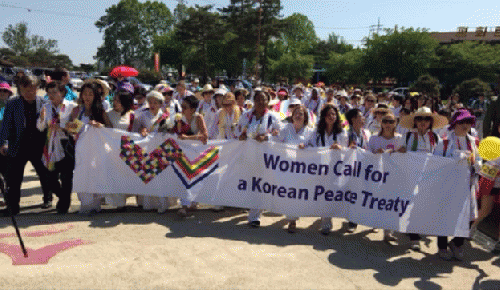 It has been announced that the 'Women's March for Peace in Korea' event will take place in late May with participation of prominent international women activists including two Nobel peace laureates Mairead Maguire (1976) and Leymah Gbowee (2011). It is reported that the women will walk across the demilitarized zone (DMZ) to call for peace and reunification on the Korean peninsula. There is growing concern, however, that the event could be exploited as a means of propagating the North Korean regime. Criticisms are also rising that it is just a demonstrative effort to draw international interest in disregard of North Korea's human rights abuses against its people. North Korea's superficial act of peace is nothing more than another exercise in deceit. The regime's evil nature was vividly demonstrated when it invaded South Korea after all of its deceptive suggestions about talks and peace-building. Worse still, the ruling Workers' Party of North Korea states in its political platforms the communization of the Korean peninsula. In circumstances like this, the urge of the women participating in the DMZ crossing for 'an official end to the Korean War' sounds like an empty cry, as they are hiding their heads in the sand. They should rather extend a helping hand to women in North Korea, who are suffering human rights violations, than holding a demonstrative event. We have to pay greater attention to the appalling situation of North Korean women who are deprived of their freedom and the most basic human rights, let alone the rights of women. We should remember that on March 3, in celebration of the International Women's Day (March 8), about 40 female North Korean defectors called on the global society to take active actions for improvement of the human rights of North Korean women. Women in the repressive state are subjected to exploitation of labor and sexual aggression, and they are even forced by the regime to marry someone they don't want. It was known that, several years ago, the party committee of Yeongbyeon County in North Pyeongan Province picked 'pretty and good-natured women' and forcibly married them to about a dozen young men who became physically disabled after being exposed to radiation while participating in the country's nuclear development project. The secretary of the party committee coerced the women to agree that 'the marriage is confidential and shall not be disclosed to anyone outside'. Their life after marriage was terrifying. North Korea's intelligence agency officials kept tight control, threatened the women to keep the secret and sent them to a labor detention camp if they asked for a divorce. One of the women, who came in contact with me, confessed that she chose a six months of labor which she thought would be better than the horrible life living with her husband. A young beautiful woman in her twenties, who once had hopes and dreams, was forced to marry a crippled victim of radiation and was finally detained in a labor camp. It would be utterly absurd to believe that the one-off DMZ crossing event would prompt the North Korean regime that exploits its women for keeping its political system to give up its ambition for communizing the Korean peninsula and change its direction to peaceful reunification. It is still not too late for the human rights advocates to take real actions to improve the human rights of North Koreans, especially women. Can North Korean women have hope in such a brutal country?